I am always so excited when I have just the 'perfect' piece on hand when a client is searching! For this project, one of the Red Door Lane customers was trying to find a vintage pedestal table for their kitchen, and I just happened to have one on hand that had not yet been photographed and listed online! (Just goes to show, you can always reach out and ask - we might have something that's still in a pre-inventory status!) 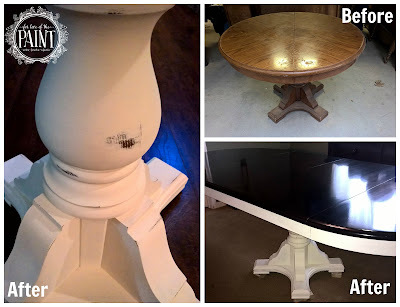 This was a beautiful, solidly built piece that I just knew would be a perfect match :) Luckily they agreed, and loved the idea of a dark stained top and antiqued, distressed white pedestal base. This color scheme is gorgeous, classic, and super versatile! They even used a blend of Old White and Pure White on their kitchen cabinets for a fresh, clean updated look. Here we used General Finishes Java Gel Stain and Annie Sloan Chalk Paint in Old White for the base and apron around the top of the table. I hope this piece is super happy in her new home! !